HMS ARGYLL (F231) a Type 23 Duke class frigate built by Yarrow Shipbuilders and launched on the 8 April 1989 by Lady Levene and commissioned 31 May 1991. She is the third Royal Navy ship to bear the name. In the 2000 HMS Argyll was the West African Guard ship during the Sierra Leone Civil War. Several deployments to the Persian Gulf followed, until 2010, when she underwent modifications and upgrades. She is 436 ft 4 in long with a top speed of 28 knots and a displacement of 4,900 tonnes. She has a complement of 185. 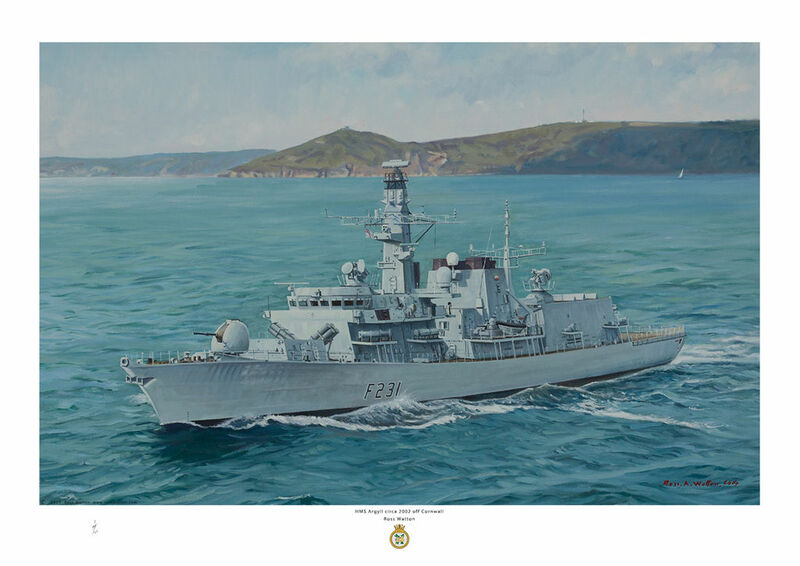 The picture shows the ship as in 2002, and was commissioned by a former commanding officer.